This year has been about transition for me, as you may have noticed if you follow my blog, Fresh American. I’ve been renovating and moving into the house that belonged to my late mother, and now I’m just over a week away from hosting my first Thanksgiving there—where Mum, the consummate hostess, celebrated many a holiday. As a designer, I believe that every tabletop is an opportunity for a bit of sassiness and self-expression, and so lately I’ve been having fun playing with some of Mum’s vintage plates, glasses, flatware, and accessories, and mixing them up in new arrangements. It’s comforting to have those bits and pieces, and all the memories associated with them, around during the holidays. It helps me connect not only with Mum, but also with all my family and friends who are carrying on the tradition with me. 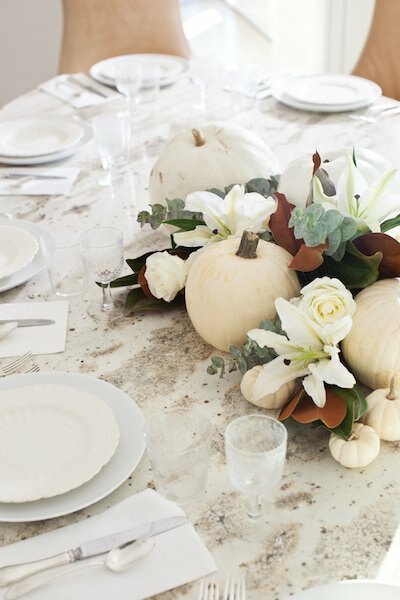 For this tablescape, I was inspired by the rich variation in neutrals—from snow to cream and chocolate—in my indigenous Vermont granite dining table, created by Adam Ross Cut Stone Company based in Albany, New York. I started with the dessert plates, which are antique Copeland Spode and once belonged to my great-grandmother. Their stunning, raised lacelike pattern are at once astonishing yet subtle. I placed these on top of the “blank canvas” of contemporary white chargers from Crate & Barrel for an instant dose of depth and dimension. Not to mention plenty of room for all the side dishes I want to serve on Thanksgiving! Those amazing tumblers and stemware are also from my great-grandmother’s collection. 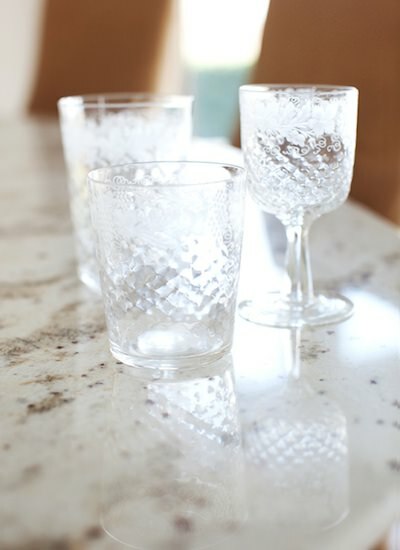 With their Old World, etched grapevine pattern, they’re an exquisite addition that really elevates each setting. Mum was the keeper of fine, ironed linens—they were always perfect!—so I chose a set of her simple, elegant linen damask napkins. The silverware, Mum’s again, and monogrammed with an S for Shreve, works equally well for Selke! Now it’s your turn. What family tradition or heirloom are you spotlighting on your table this year? 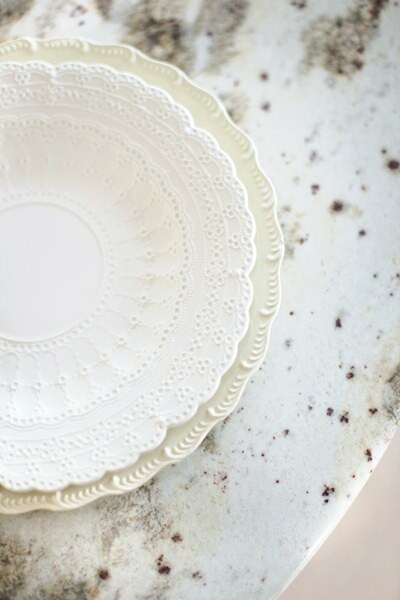 Tell me in the comments for your chance to win a two sets of Juliet embroidered napkins from Pine Cone Hill—a $96 value!